The 'Monty Effect': Expect a Change (For the Better) in How the Stars Transition the Puck - The Point Data-driven hockey storytelling that gets right to the point. 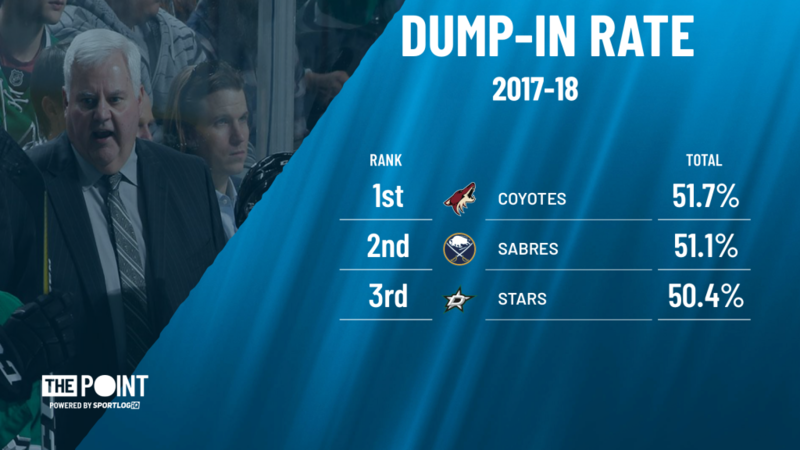 Last season, under Ken Hitchcock, the Dallas Stars were a dump and chase team that finished 10th in the West, 3 points outside of a playoff spot. Expect that to change with Jim Montgomery behind the bench. 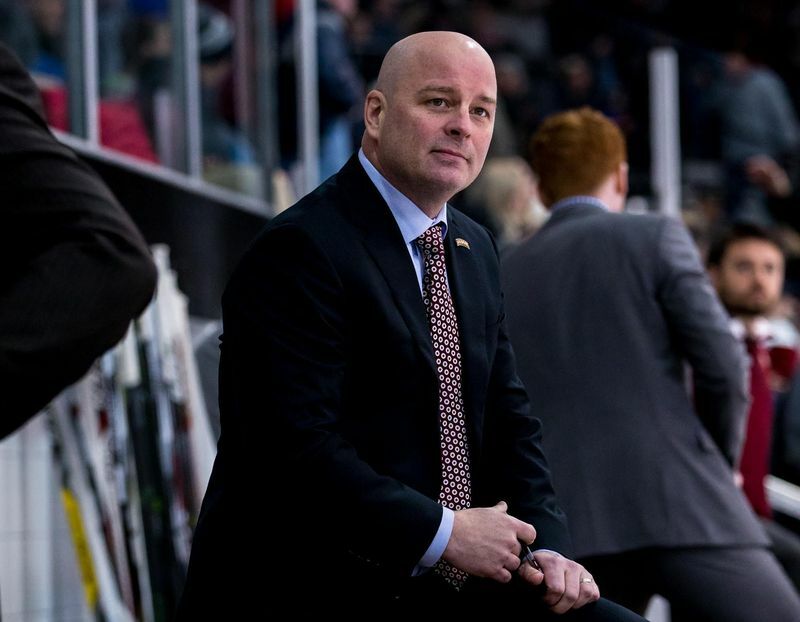 They made the bold move of hiring Montgomery from Denver University, making him the second acting head coach in the NHL coming out of the college ranks. During his introductory press conference, Montgomery made the statement, “I’m going to go by Monty, I’m not going to go by Jim.” As one of his ex-players in the USHL, I wouldn’t have it any other way. Stars GM, Jim Nill, has said that once he asked around about ‘Monty’, he was informed that he was one of the best-kept secrets in hockey. With a roster full of young “stars”, pun intended, they’ve looked like a team for the past few seasons that’s ready to make the jump towards being a contender. Since ‘Monty’s’ hiring, he’s been stressing a puck-possession game where his players will be given every opportunity to show off their creativity. In talking about championship teams, he’s said “The teams play a certain way. There’s structure to their game, but there’s creativity and flair to it too. You have to let the horses run.” So, how does that compare to last season? Well, under Hitchcock, the Stars were the opposite of creative, dumping the puck at a higher rate than everyone except Buffalo and Arizona, the lowest scoring teams in the league. The dump and chase style was clearly a major factor in limiting the Stars offense which ranked 29th in odd-man rushes and went offside more than any other team. So not only were they not trying to create anything off the rush, they weren’t taking advantage of the few opportunities they managed to generate. It’s easy to say that next year the Stars will be a puck-possession team, but if it’s that easy, everyone would do it. Does Dallas have the skill required to drastically alter its transition game? On the rare chance someone tried to have a clean entry, the Stars tended to be successful. They ranked 13th for even-strength controlled entry success rate. For a team that avoided doing it, they were pretty good at it. With ‘Monty’ saying, “I want to have more clean entries and I want teams, it’s something we’re going to track, is how are we doing, especially within a game, clean entries compared to the other team’s clean entries… I don’t care if we block a lot of shots. I hope we have the puck so the other team has to block them” you start to get a clearer picture of what he’s hoping to accomplish with his team. It’s important to note that their top goal scorer, Tyler Seguin, was held to fewer than 3 controlled zone entries per 20 minutes of ice-time, ranking him 291st in the league in that category. Not exactly hanging with the top forwards in the game; however, when he did attempt to gain the zone with the puck, he did so at a high rate. 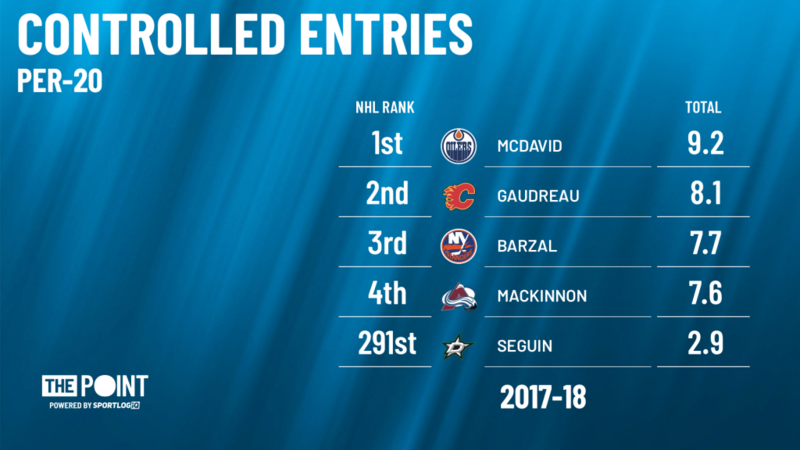 Seguin was successful on 65.2% of his entries, leading all Dallas forwards and ranking him 33rd out of players with at least 500 minutes of ice time. Seguin was playing within Hitchcock’s system, dumping and chasing more often than not, even though his stats suggest he’s perfectly capable of transitioning the puck effectively through the neutral zone. Seguin is a horse and ‘Monty’ seems ready to let him loose. And here’s why it’s important to attack with the puck. Of all goals scored last year off a zone entry, 75% of them were scored within 10 seconds of gaining the blueline. Being able to generate quality looks in transition is clearly important if you want to be a high-scoring team. While this would suggest the dump and chase style is outdated and no longer works in the current NHL, it’s worth noting that it allowed the Stars to have one of the stingiest defenses in the league. Dallas allowed fewer shots on goal than any other team. The Stars also allowed the fewest high-danger shots, ranking 1st in shots against from the inner slot and 2nd in shots against form the slot. Strong team defense played a major role in the Stars having the 2nd lowest goals against in the league. 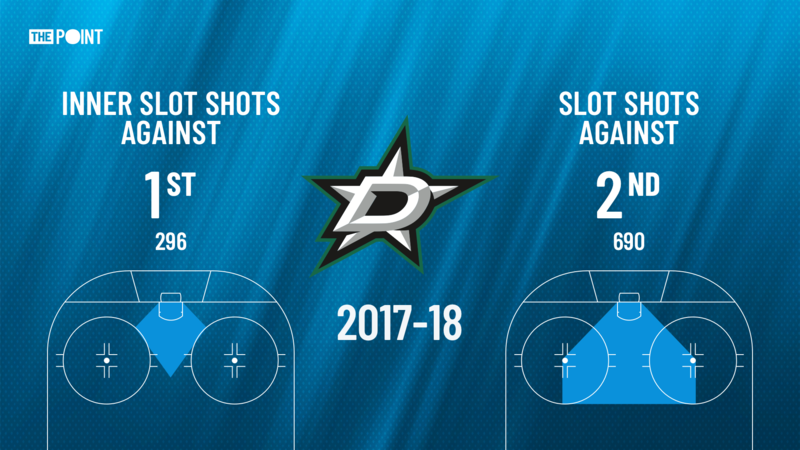 As the Stars move into the ‘Monty’ era, they’ll be looking to find that perfect balance between a more creative possession-based attack while maintaining that solid team defense. If they can achieve that balance they could go from being a team on the outside looking in, to not only a playoff team, but a team that could do some serious damage in the Western Conference. If ‘Monty’ lets “his horses run”, we could see some extra creativity and energy brought back to their offense letting them reach new levels we haven’t seen from them.